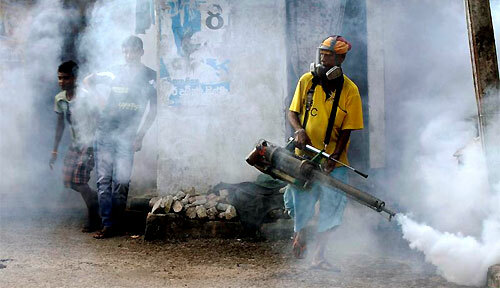 The Health Ministry said on Wednesday that the endemic dengue had reached killer proportions especially in the Western Province with 65 deaths so far this year and thousands of victims. For the past few years international homoeopathic consultant Joe de Livera has been trying to open the eyes of the Health Ministry and the medical fraternity to the homeopathic remedy that is being used extensively in India to cure dengue. The remedy is Eupatorium Perfoliatum 200c. It was imported from India and given to many patients who were known to be suffering from dengue in Sri Lanka. They were cured within one to 12 hours after taking the first dose of a large teaspoonful (5ml) of the water remedy from the bottle with subsequent doses taken every three hours. Mr. de Livera says it was a matter of concern that though he offered to give a group of doctors whom he recently addressed at a meeting, this same homeopathic remedy free of charge, none of them was prepared to accept it. They said they dared not do so for fear of the repercussions that could follow by using a homeopathic remedy to treat their patients. They frankly admitted that there was no drug that could be used to treat dengue or any other viral flu but they could not dare experiment with any remedy or drug that was not specified in the government pharmacopoeia. The doctors were informed that the homeopathic consultant would be medicating sealed bottles of drinking water and that all they had to do was to give their next patient a teaspoonful of the remedy, but they were sad they could not do it officially in their hospitals. We wonder how many more sons and daughters of the rich and the poor alike will be sacrificed though unnecessarily to dengue and the other virus diseases sweeping across the country today. Mr. Livera says he can personally vouch for the fact that anyone can be infected if bitten by an infected mosquito as it happened to him a few days ago. He was feeling out of sorts with a feeling of lethargy and tiredness on the eve of Poson Poya Day and felt decidedly worse the next morning. He had taken a dose of this remedy in the morning as soon as he was certain of harbouring some virus-borne disease. He took the second dose shortly before lunch and was relieved to feel quite normal by evening. His plea to the doctors, especially those in the children’s hospitals in the city is to give this remedy a chance to save their precious lives. The doctors in the hospitals admit they have lost the battle. The least that can be expected of all those in the medical profession, is to lay aside their prejudice against homeopathy and use the remedy.